EastSouthWestNorth: "How Can I Not Slaughter You"
"How Can I Not Slaughter You"
This is the title of a new book. The title is a play on a movie/song "How Can I Not Think About Her." 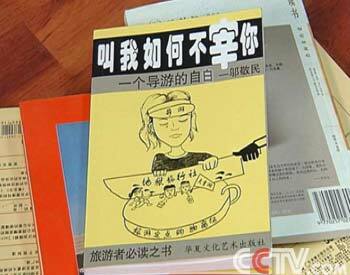 The contents of the book were originally published in the blog of Wu Jingmin (邬敬民), who was a tourist guide in Shenzhen. This is an example of a business model in the Internet age. First, one develops a concept for a book. Under normal circumstances, it would be hard to find a publisher for a controversial proposal from an unknown writer. So Wu Jingmin published the 90,000-word "How Can I Not Slaughter You" on his blog, and this was subsequently cross-posted in many forums and bulletin board systems. By now, this lengthy book has received the hype (including a CCTV interview) and gotten the interests from the publishers. Even though many people have read the book on the Internet, it is not easy to read a 90,000-word book on a computer monitor. Thus, the printed book still has a market. Besides, the mainstream media attention has also gotten him a previously unknown audience. (Southern Metropolis Daily) How Can I Not Slaughter You (叫我如何不宰你). By Pu Defa. May 10, 2006. Wu Jingmin had been a tourist guide for many Shenzhen travel agencies over the years. He published a book titled "How Can I Not Slaughter You" and caught the attention of the media. The contents of the book are based upon his personal experience about how tourist guides "slaughter" the tourists (that is, rip off their money). After Wu was interviewed on television, this affair quickly created a "strong shock" with the tourism industry in Shenzhen. Yesterday, our reporter interviewed many leaders and tourists at travel agencies, and the most frequent opinion is: "The problems that he described may really exist within the tourism industry in Shenzhen, but it is definitely not mainstream." Yesterday, Wu Bin, who is the Shenzhen Tourism Association vice-president and the person in charge of Shenzhen National Travel Xinjing company, was interviewed by us and said: "The phenomena that he described should exist, not only in Shenzhen but across the country. The critical question is whether this is mainstream." According to Wu Bin, many travel agency owners believe that the phenomena are concentrated within certain small- or middle-sized travel agencies and certain organizations are sub-contractors for travel businesses. "This affair will directly the image of tourism in Shenzhen. Will tourists dare to join the groups organized by the tourist agencies?" A veteran Shenzhen travel agency worker decried. "How can it be as frightening as he put it? There may be individual instances, but he makes them sound as if this is everywhere." Wu Jingmin said that the tourist guides are workers with three "No's" -- no wages, no insurance and no basic protection. With respect to this assertion, Shenzhen National Travel Xinjing company and several other large tourist agencies responded: "Including National Travel Xinjing, many travel agencies provide to their tourist guide a base salary, travel subsidies as well as an incentive plan, so that they have a minimum fixed income." Concerning the so-called "inside secrets" described by Wu Jingmin, Wu bin explained that many Shenzhen travel agencies have formed an effective supervisory system. For the outside, when the shopping locations are selected, they absolutely will go to those designated by the local provincial or city tourist department in order to have guaranteed quality. If something goes wrong with the quality, refunds are possible. Furthermore, through the auditing system, the oversight system and the feedback system, the quality control department at headquarters will directly sample the shopping locations and interview tourists in order to understand the situation. Internally, the company guarantees that its own tourist guides have a basic salaries, travel subsidies as well as incentives; part-time tourist guides also receive insurance and travel subsidies. "If we find that a travel guide has broken the regulations or the laws, a small case will result in a warning and a serious case will be referred to the judicial system." Prior to the publication of the book "How Can I Not Slaughter You", Wu Jingmin had published "How Can I Not Slaughter You" on his personal blog. People have often heard about how tourist shops set up traps to take advantage of tourists. Wu Jingmin pointed out that such shops have three special characteristics: second-rate (次), fake (假) and dishonesty (虚). Why do so many tourist shops sell jade? Why won't they television sets? Because everybody knows the actual price of television sets, but they don't know about jade. Therefore, nowadays, the shops sell pearls, jewelry, medicine and tea leaves because it is easy to fool people. "I once took a group from Taiwan. The shop salesperson took the client into the VIP room, opened up the safe and took out a jade bracelet. What was the asking price? HK$ 100,000. This person was not interested and made a counter-offer as a joke: How can it be so expensive? How about $1,000. So the group manager, the division manager, the company manager and the general manager of the shop all came one after another to negotiate. Finally, the transaction was completed for $1,000." What is even more shocking is that the shopping at designated locations is where the clients get "slaughtered" the most. According to Wu Jingmin, the shop must offer a higher commission in order to attract the tourist group to bring people there. "Ordinarily, the tourist guides gets only 10%. But the shops offer 40% to 50% and the tourist agencies get the rest of the money. Apart from the commission, the shop also has to pay me a headcount fee and a parking fee. When I bring someone into the shop, they will have to pay me whether the person buys something or not. That is a headcount fee. If I drive the car over to your place, you must pay a parking fee." According to Wu Jingmin, he has personally worked as a tourist guide for many Shenzhen travel agencies for more than a decade. Reporter: How can we believe that what you say is true? Wu Jingmin: It is very simple. Right now, you can go to Thailand, Singapore and Malaysia for 2,000 RMB, 199 RMB to Thailand alone and just over 50 RMB to Hong Kong. Is that possible? There has to be be a trap. Anyone who can think and has some sense must know that there is a trap.